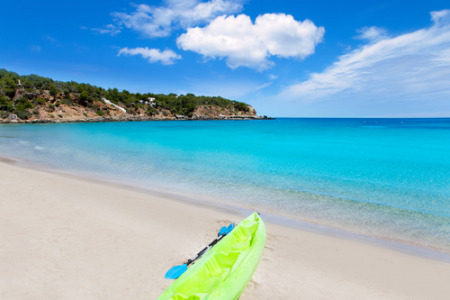 Playa de Talamanca holidays take you to the south east coast of Ibiza, close to the island's principle town. Holidays to Playa de Talamanca can be taken from April until late October with temperatures rising from twenty to low thirties at the height of the season. It is a peaceful resort with a soft, sandy beach washed by crystal clear waters that offer safe bathing to children and less confident swimmers. A variety of water sports are available from the beach. Holidays in Playa de Talamanca attract families with youngsters, as well as couples seeking a restful break by the sea. Those who wish to relax by day but want to party through the night are also drawn to the resort, as here they can have the best of both worlds by spending their days relaxing in Playa de Talamanca and their evenings in Ibiza Town. Our cheap Playa de Talamanca holidays have broad appeal and since they are such good value, we sell out quickly. In order to avoid disappointment, please book early. The resort has a good range of accommodation and some excellent restaurants. Shopping is rather limited but this matters little as Ibiza Town, with its plethora of shops, is almost on the doorstep. If you are seeking a guarantee of summer sun, check out our low cost Playa de Talamanca holidays now. For further information and to view our last minute Playa de Talamanca holiday deals, please use the search facility.